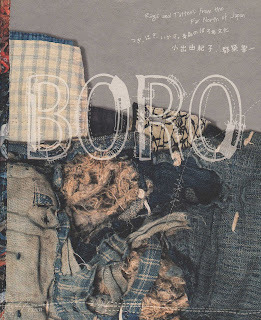 BORO: Rags and Tatters from the Far North of Japan. ed. Yukiko Koide and Kyoichi Tsuzuki. The Boro shown in this book is the sum of 40 years of field work by researcher Chuzaburo Tanaka. A few decades ago, Tokoku and Aomori, the northern part of Japan (snow country), meant 'dire poverty' to most Japanese. These dirt poor farmers, out of desperate necessity, created an astonishing textile out of boro- mere rags. Boro became 'survival' and any scraps of old cloth were coveted. The smallest snippets were saved and re-used over and over until the rags finally turned to ash and returned to the soil. Work jackets to bedding, were stitched, layered and repaired over and over. This cultural heritage survived and is now revered. 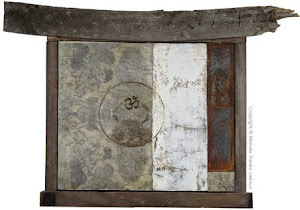 Things wabi-sabi are usually small, quiet and inward-oriented. They beckon: get close, touch, relate. Things wabi-sabi may exhibit the effects of accident, like a broken bowl glued back together again. Or they may show the result of just letting things happen by chance. India, who lives in Australia, makes felt using wool and water and woven textile fabrics, and dyes cloth using plants and water. You can find her very entertaining blog, Not All Those Who Wander Are Lost, here and her beautiful website here. Regina lives on Caribbean island called Netherlands Antilles. 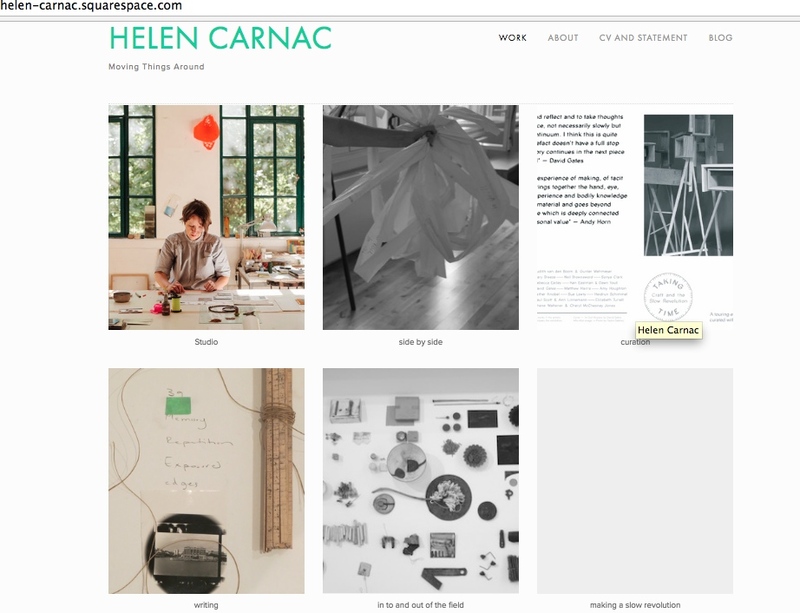 She works with paper and fabric, and her beautiful blog, Mostly Turquoise, can be found here. 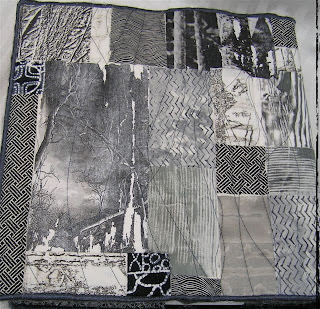 For this piece titled BRANCHING OUT, Lorraine at Creative Daily used photographs of branches and bare trees, which she digital manipulated, printed the images on fabric and then pieced them together for this journal cover. You can find her wonderful blog here. You never disappoint! Your current post is a delight and eye candy as icing on the cake. Once again you have me stopped in my tracks and having to shift gears, so that I may contemplate upon that which you have shared with us this evening. I thank you so very much for your presence on the Internet. 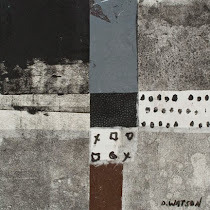 Thank you Donna for your latest post, your new collage is,as always, inspirational and the book 'Boro' is a real eye opener, I will try to acquire it. Your quotes from Leonard Koren are very apposite. I don't even know what to say about this blog post. The "Boro" photos are absolutely amazing. Your collage, once again, is remarkable; and your links to talented artists are a treasure. Thanks, Donna. As always. Yet another post to warm my heart! 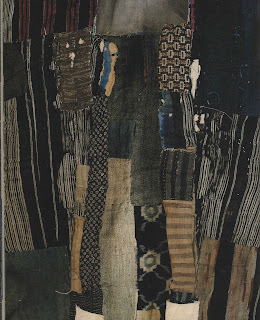 Such gorgeous antique fabrics and the book looks very enticing.Your collages speak to me and this one is no exception. I love the tiny dots and spots and the shades of grey. I enjoyed Nikki Giovanni's words ...."When I am frayed and strained and drizzle at the end.."
Donna - your posts, as they are composed, are complete works of art! Wonderful to behold and contemplate. Thank you. 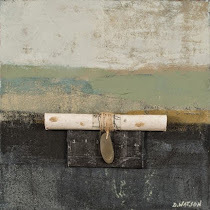 There is a soulfulness in this new work of yours Donna. 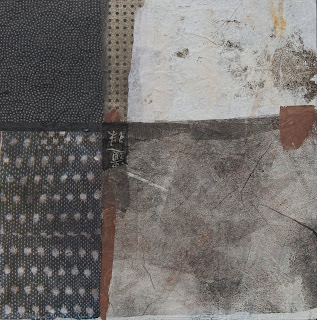 Piecing, patching, choosing, placing and making collage is a meditation, and it shows. 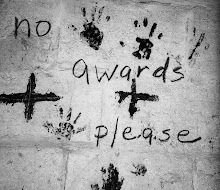 The time honored tradition of making do, and using what we have is celebrated and elevated with the artists visions which you have presented here. Thank you. Inspiring as well as informative, your post is a validation of handwork and resilience. Thank you for this splendidm most interesting post. 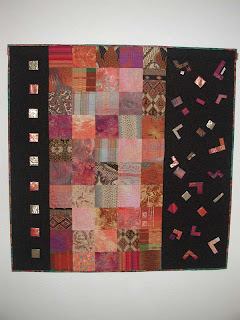 I loved to see the picture of one of my quilts and having my blogname mentioned. Another beautiful post, DW! 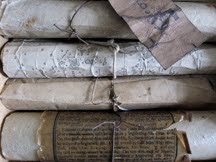 I enjoyed learning about Wabi-Sabi and reading your collected writings. Looking forward to following your links! Take care. Hi Donna! Thank you for including me in this most interesting post. Will read up more on Wabi Sabi! I'm really intrigued by the idea of wabi-sabi. I've heard it referred to by various artists over time but have never explored it. I'm particularly intrigued by the idea of employing it with photography. May be more of a challenge since you lose the tactile quality that can express the "imperfect beauty" so well. Thanks for sharing all of this - inspiring! What an amazing post, your beautiful art and those of so many others. work. 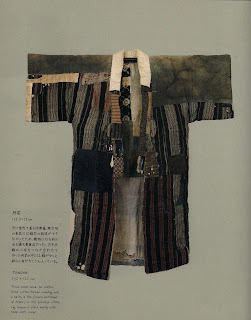 The Japanese sensibility of using material until it is used up is so integral to the way I am thinking now about the world and our place in it. you are so lucky to live in such a tropical warm place. Indie, Lorraine and Regina-- thank you for saying YES to be included this post on BORO. Wonderful and touching post..It is amazing. Thank your for sharing so much. So many things to respond to and new blogs to look at. You find such amazing things. 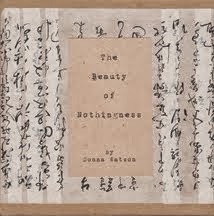 I have never heard of Boro (and the story of it is amazing) but know wabi-sabi and own the Koren book. I was struck by the sentence in the quote "Things wabi-sabi are expressions of time frozen" as I just journaled and posted on feeling frozen in time. Thinking it a negative thing. But wait, there are other ways to look at it, no? I have the same paper you placed in the upper left hand corner of your collage. I bought several sheets years ago and am almost out now. It is lovely as is your collage. A delicious post. Your new work is scrumptious, as well! Speechless...almost! 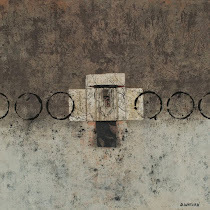 Wonderful new piece...reflective of meditation and silence. Your links are so valuable and explaining and showing photos of this BORO are absolutely inspiring. I read the words of Donna Zagotta about you and your blog and am clearly in agreement. thank you, donna, for the visit on my blog! I added the translator! The philosphy of Wabi Sabi, feels so natural to me. These are beautiful examples of textile. And of course your own precious work, once again beautiful. Wonderful, I have been turning to re cycling fabrics and hand stitching tiny quilts and these gave me more ideas, I loved the end poem, seems very fitting some how, especially to one who thought she was immortal and is now discovering she isnt! oh, you!! and nikki giovanni!! that poem is such a treasure, as are you, and these artists you've listed. i will go visit them. and wabi sabi is such a fun word for such a gentle and snug concept. i saw you posted yesterday, but was "afraid" to venture over until i changed passwords, verification notifications etc after leslie post about those ole hackers. trouble in our paradise, but we shall overcome! Your images and words are so quietly beautiful. They evoke calmness and appreciation. Your friendship will be my quilt. 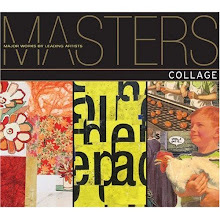 Beautiful collage and collected fragments. It's interesting to read these views on Boro, and makes me wish that so much of the old in Japan was treasured for it's preciousness as you describe in the everyday. Where I live the old and weathered (boro boro) is torn down right and left, and replaced with a love of all things new. Your post makes me think and reflect upon my relationship with Japan. How I always loved the old that I associated with Japan before I came to live here. And how I love Japan still in it's ever-changing form, even though I cringe to see trees being cut down and replaced by asphalt, and old houses torn down and replaced by new 'mansions'. I wonder that it is teaching me to adapt a 'zen' attitude, that all things change. And remain the same. Thank you for sharing your reflections and showing the beautiful things you 'find'. I dedicated one of my finds from today to you! I've seen this book on a few blogs now. I think it holds a lot of inspiration! I'll have to buy it! great post i agree! i recently got turned onto the phrase wabi-sabi and connected immediately with it. love reading more about this and the history/culture in japan. astounding the industriousness of people. i like your new work too, as well as the links to others. inspiring post Donna. now i don't feel so odd for saving every little scrap.. the more distressed.. the greater the value to me. 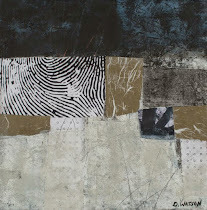 your latest collage is gorgeous..love the textures and tones and the transparent layers. 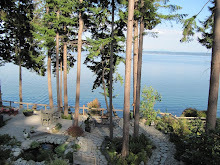 Donna -- wonderful entry on wabi-sabi! There is a series of books by Nuno Nuno, each one exploring a different tradition of textile work: boro, sukesuke, fuwafuwa, shimijimi, kirakira and zawazawa! Also, thank you for the fascinating entry on Hannelore Baron! A very inspiring post Donna and of course your work is stunning... all this AND Nikki Giovanni! beautiful! 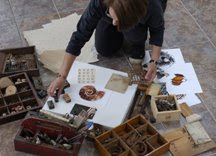 It is one thing to have a collection of wonderful scraps and textures and then through serendipity or scrupulous adherence to composition aesthetics, create a piece/space of absorbing art. Work and grace go hand in hand in art. Loved the post and the Giovanni quote ending was perfection! Just fascinating. It is a wonder how such beautiful things can be made from scraps! D. Thankyou for this. Those coats of many pieces are so touching. We use and throw away so much these days,the images make one pause and think. Your words at the end of your post will stay a while with me. Donna you've captured so much of the feeling of the book in your collage. 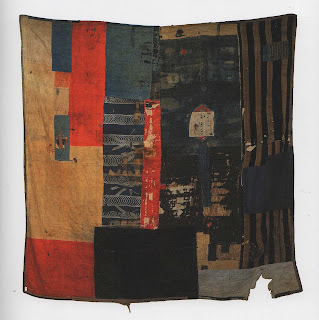 I see the preciousness of the little scraps and worn bits and so loved this. As I walk the beach it isn't the perfect whole shells I seek but those broken and washed over by countless waves. They are my treasures. Great post on such fascinating stories and artwork. Inspiring collages. The term wabi-sabi is also so foreign to me- glad to see it used and it's meaning. A beautiful, beautiful post. Layers of love, connection, remembering, forgetting, creating something new from the scraps of life. This is what I love about collage. 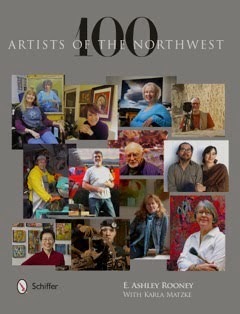 I look forward to visiting the links to the other artists you've included in this post. Donna - I've just come over from Alicia's interview of you. I had for a little while been a visitor to your blog but somewhere along the line, lost you...Well, I'm back and glad I am. Your interview and your work is TOTALLY refreshing and very inspiring. Hello Donna. I am thrilled to have discovered your blog and your work via the Tangled Sky Studio blog. I am looking forward to reading your past and future posts and discovering more wonderful artists through your links. Thank you very much for creating all of this!! Just had t say how much I enjoyed your interview with Alicia. Thankyou for taking part and sharing a bit of your background and for your advice on your life reflecting your art..too true! As always I'm inspired and learn something new from your informative and wonderful posts.The quilts spoke to me in such a haunting way. My grandmother made quits from fabric samples that came from their store sample books. The lining was made of her old sheets. Soft and worn. My favorite part of the quilts. All that I can do after reading all of these magnificent comments is to enclose my heartfelt 'bow in your direction'. everything about this post is poetry...to move through it slowly and with care is to be visually and literally entranced. well, that may be a must have book. what an amazing post, donna. so rich with color and texture and insight. i adore all of the photos and am excited to go visit the blog and website you've shared with us. thank you! Love your blog! Thanks for hosting me this week! thanks so much for stopping to visit my newbie Wabi Sabi finds Donna...I really appreciate your artist eye and am intoxicated with the way you view the world...such good medicine you bring. 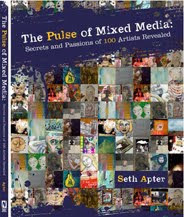 I've added you to my 'artist's work that I admire' blog list and trust that this is Ok with you. Hi Donna. I have just found your blog site. l Love it. The boro and the wabi sabi are ME!!! My blog site is http://wabisabiart.blogspot.com I look forward to following your posts and I will join the Collage swap.